It was a typical Thursday in the life of a high school teacher as the end of the marking period was quickly approaching. As soon as I finished teaching my classes, I began furiously correcting tests to make sure that my students would receive timely detailed feedback and the grades would be entered in time. In addition to the piles of uncorrected papers on my desk, my colleague and I were meeting to plan our next unit, a completely new series of lessons, and we needed to come up with something phenomenal. No pressure. By the beginning of the afternoon, I needed a break. And coffee. I was expecting a phone call, so I quickly ran down the hallway, refilled my coffee cup, and ran back to my classroom. One of my former students, Carissa, had emailed me the day before. She was working on a project for one of her college courses and wanted to ask me a few questions about my former job as a scientist to use for a paper. We had set up a FaceTime call for 1 pm and precisely on time, my phone rang. Then Carissa began reading. When her first two words were "Thank you," I began to smile. She described herself as a small, shy, completely and hopelessly lost high school freshman who had believed that her options in life were limited to what girls "typically" do, to the careers that Barbie does. After taking my class, Carissa told me that her entire perspective had changed. She thanked me for not only teaching her about polymers and the carbon cycle, but for teaching her that she could be enthusiastic about her curiosity and desire to learn. She thanked me for helping her realize that she loved science, asking questions and searching for the answers. I felt a lump forming in my throat as she described how she learned that it was okay to be herself, a nerdy science enthusiast, and that there would be plenty of people in the world who would like her and want to be friends with her for who she is. As she neared the end of her letter, Carissa stated that without me, she would not be where she was today, she would not be at RPI (Rensselaer Polytechnic Institute), and she would not be working hard to achieve her big, bold dream of someday becoming a distinguished neuroscientist. I wiped away the tears and pulled it together as best as I could as I thanked her profusely for reaching out to me and sharing such beautiful and heartfelt words. I know the conversation I had with Carissa by heart because I asked her to send me the letter she had readto me, and I immediately laminated it and placed it on my classroom wall directly behind my desk. The letter hangs beside pictures, thank you notes and silly science jokes, all written by former students. I love to use that wall as a reminder, especially on those hectic days, of why I became a teacher in the first place, how rewarding my job truly is, and why I absolutely love teaching. 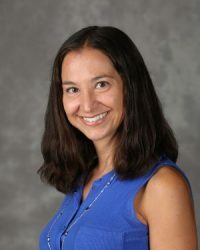 Lauren Danner is the 2017 Connecticut State Teacher of the Year and a member of the National Network of State Teachers of the Year (NNSTOY). She teaches Science at North Branford High School in North Branford, Connecticut.